The Dodgers’ bullpen has been remarkable in the first five games of this postseason, and it hasn’t all been because of Kenley Jansen. Eric Stephen wrote about its dominance today over at True Blue LA. Sheer dominance. There’s no other way to put it. We all know Jansen is incredible and Kenta Maeda‘s emergence has been something else, but I want to focus on Brandon Morrow for a moment. Morrow has been incredible in October so far, as he leads all Dodger relievers in innings pitched at 6 1/3. Jansen is second at 6 innings pitched. 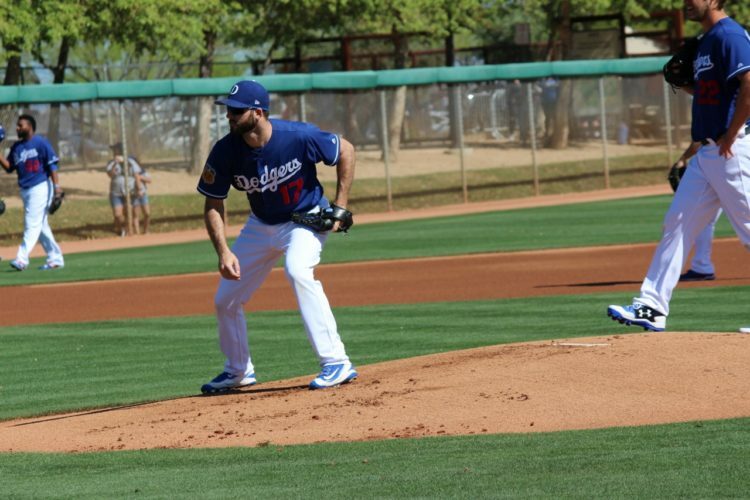 The difference here is Morrow has thrown just 59 pitches compared to Jansen’s 80. This isn’t a concern by any means, it’s meant to highlight just how good and efficient Morrow has been so far this postseason. He has just four strikeouts to Jansen’s 10, which explains the difference in pitch count. As a whole, the Dodger bullpen is averaging 10.7 pitches per inning in the playoffs. That’s incredibly efficient, considering the MLB average in 2017 was 16.7. Morrow is averaging 9.3 pitches per inning by himself, which is obviously remarkable. And there wasn’t anyone out there who could have predicted this level of dominance. Remember, he was a non-roster invitee to Spring Training makes this even more amazing. Stacie wrote about Morrow’s renaissance story in August. He has earned himself a role, but it isn’t an inning-specific role. He’s the second man up when it comes to relievers — be it the sixth, seventh or eighth innings. In Game 2 of the NLCS, Morrow (rightly) came into the game in the sixth inning against the heart of the Cubs order and got six outs on 18 pitches, including six swinging strikes (33.3 swinging strike rate, which, wow). In his first appearance of the playoffs, Morrow got four outs on seven pitches. His “worst” inning of work came in Game 2 of the NLDS. That’s when he threw 14 pitches and allowed a 3-run home run (his first of the season) to Brandon Drury. That’s the only blemish on his postseason résumé. Morrow is good against both-handed hitters, but he thrives against lefties, as they posted a .125/.183/.125 triple slash against him this season. Being able to get both-handed hitters plays into his ability to go multiple innings. If you look at Sunday night’s game, Cubs manager Joe Maddon was criticized for not bringing in Wade Davis in the ninth inning. In the post-game presser, he said he was saving him for a save situation — one that never came. That’s where Dave Roberts has thrived. He hasn’t been afraid to use Jansen for more than three outs, and he hasn’t been afraid to bring Morrow in earlier than is “traditional.” He began to go away from “tradition” last postseason. Thank goodness Roberts is the Dodgers’ manager and not Maddon or the Cubs win Game 2. Morrow has been a stabilizing force in the bullpen this season for the Dodgers. Early in this postseason, he’s showing his 2017 was not a fluke. And the best part about the premium results is that he isn’t having to throw a ton of pitches to get the job done. The Dodgers’ bullpen, despite being good in the past, has faltered a bit in the postseason. This year, it has been a strength and perhaps the most valuable part of the team not named Justin Turner and/or Yasiel Puig. This is how championships are won. Don’t believe me? Just ask the 2015 Royals.